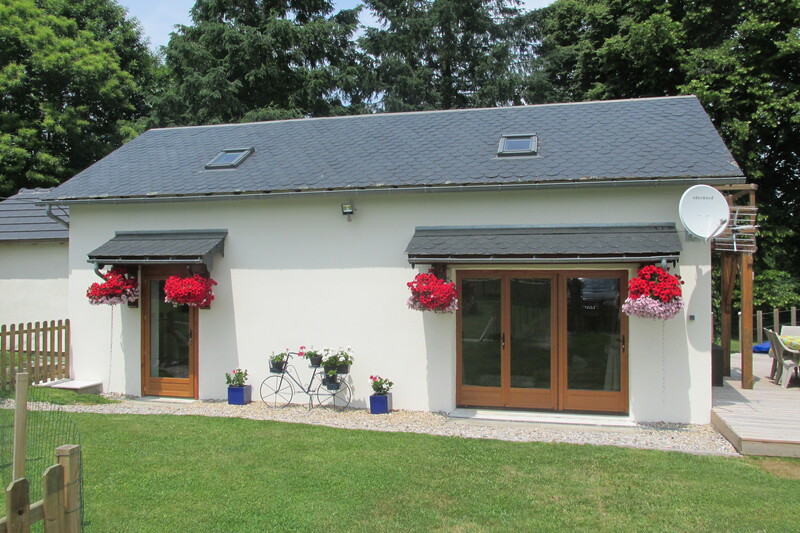 A couple from Monmouth, South Wales, now living permanently in France. 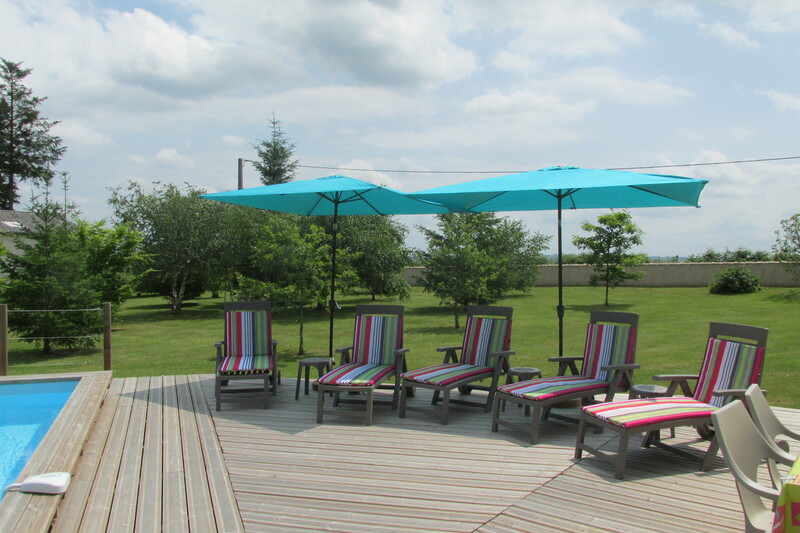 We would like to welcome you to Gîte La Graffeuille, a newly renovated Gîte, set in a quiet hamlet with stunning views of the Monedieres Mountains and, on a clear day, the Massif Central! The area is famous for its beautiful countryside and abundance of lakes. Our 3 friendly dogs and 2 cats welcome other well-behaved pets! 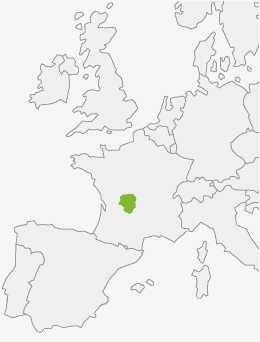 We are located in the Northwest corner of Correze, in Dept 19 of the Limousin. Both cities are 50 minutes away and have regular flights from various airports in the UK. 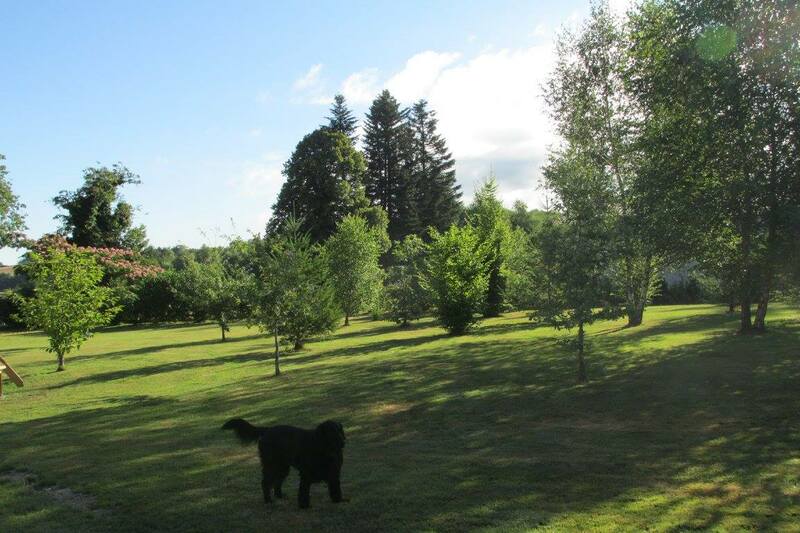 Gîte La Graffeuille and the owners' house sit in one acre of beautiful gardens. 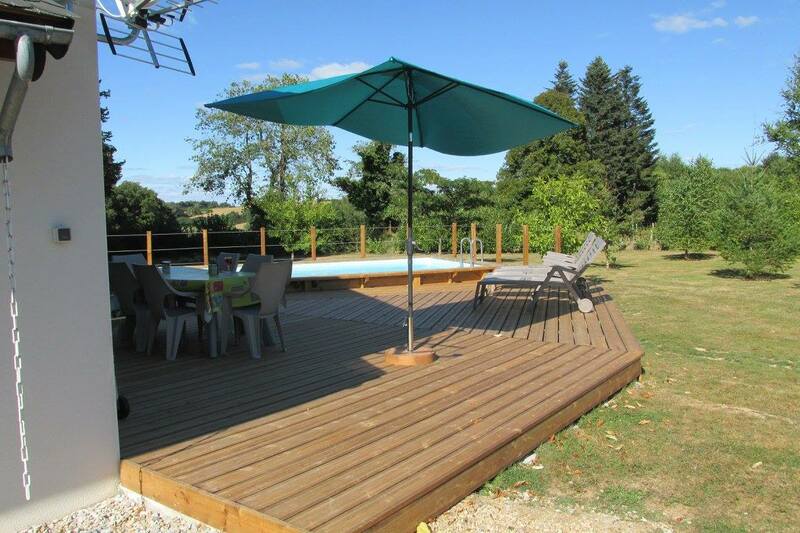 The Gîte is separate and securely fenced off from the house, with about half an acre of garden and the swimming pool, being exclusive to the Gîte guests. 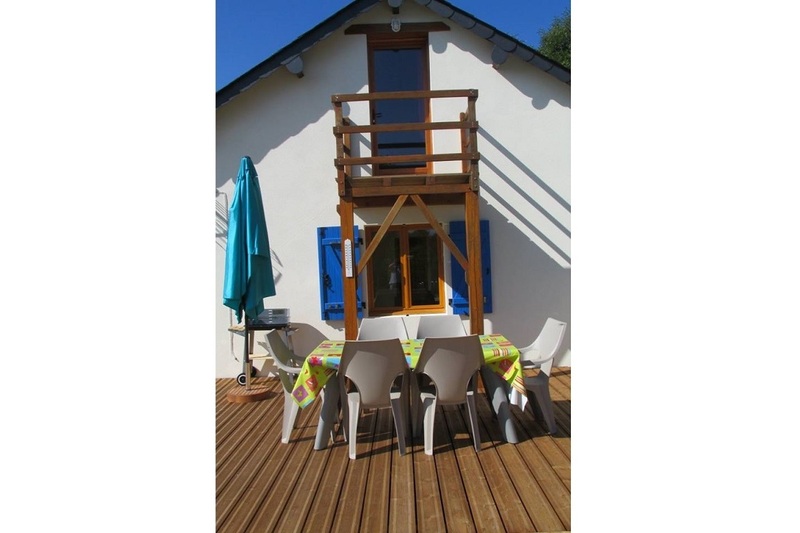 Unfortunately, due to access limitations, the Gîte is not suitable for guests with mobility problems. Please note smoking is not permitted. 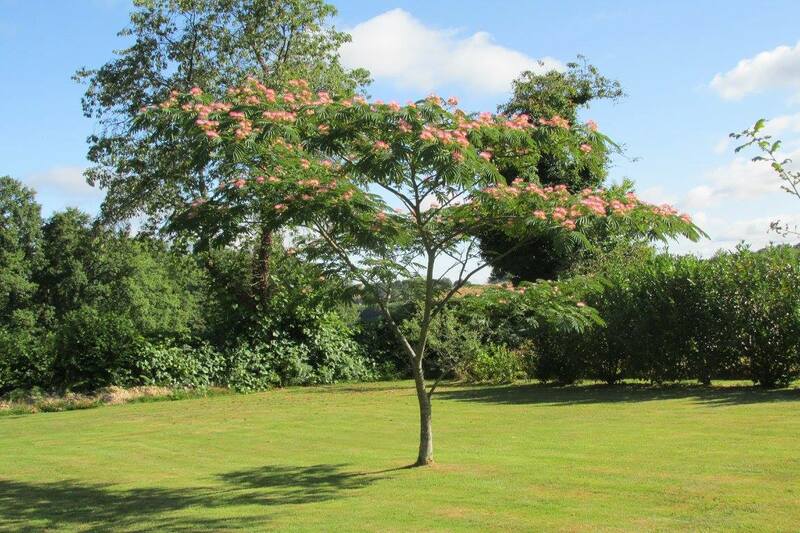 The sitting-room has a comfortable sofa and views across the garden from the triple glass doors. 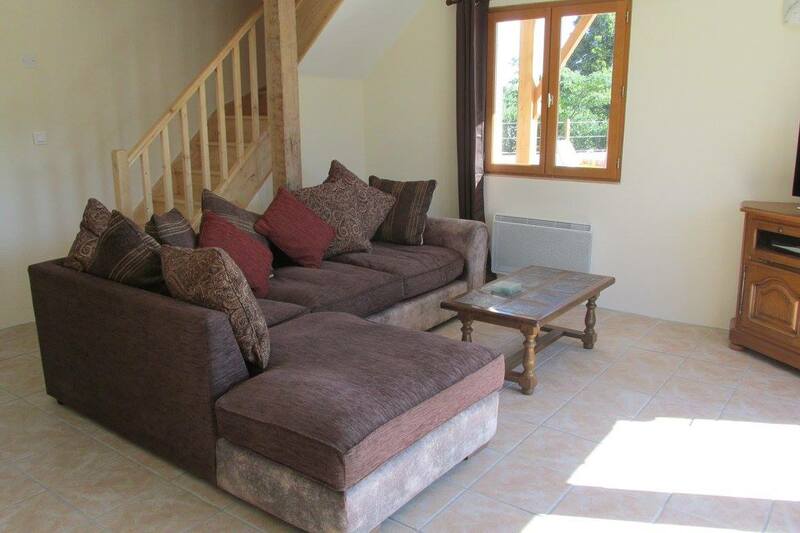 There is English and French TV, DVD Player, CD Player and a collection of books, DVD's and games. The lounge is heated by an electric fire. 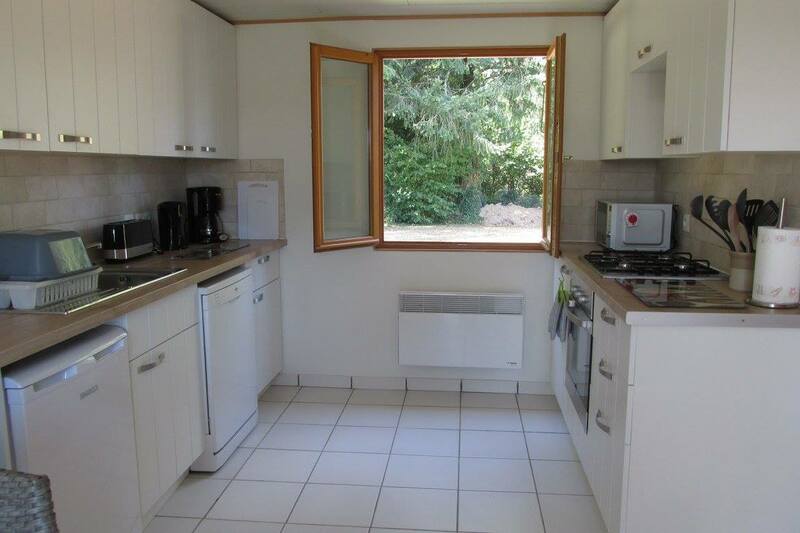 There is a spacious Kitchen/Dining area. 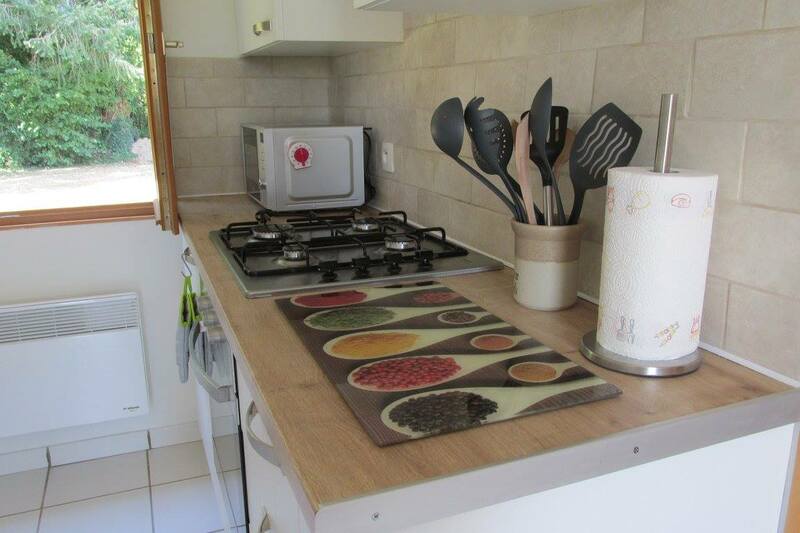 The Kitchen is fully equipped and includes an electric fan-oven with gas hob, microwave oven, dishwasher, coffee machine, kettle and toaster. The Kitchen/Diner is heated by an electric fire and seats 5 at the table. A high-chair for infants is available upon request. is close by for serving! ... is accessed via stairs from the sitting-room. 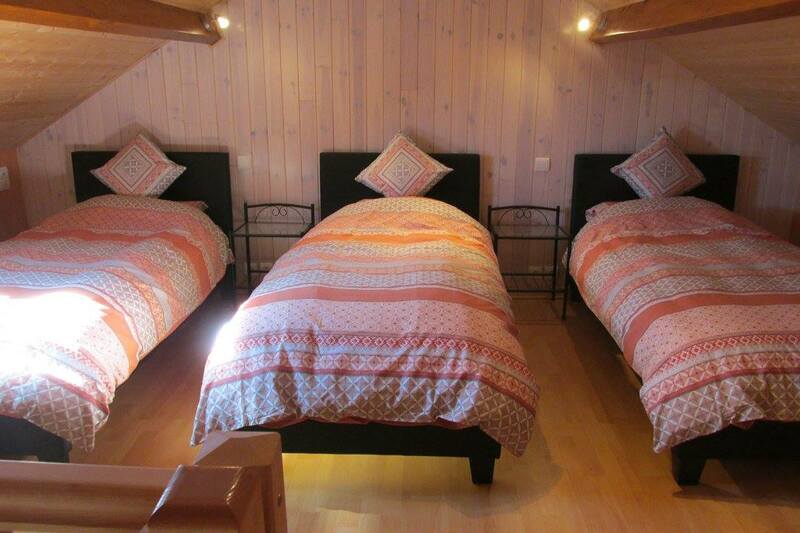 It is a good sized attic-room with a double bed. A patio door leads out onto a balcony, with a seating area for 2. The views from here are stunning! 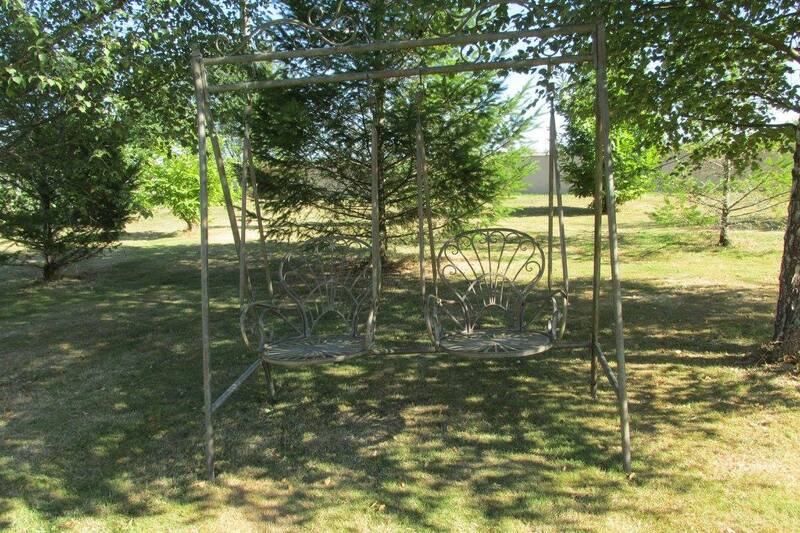 A cot is available on request. All linen is provided. ... is accessed via stairs from the dining-room. 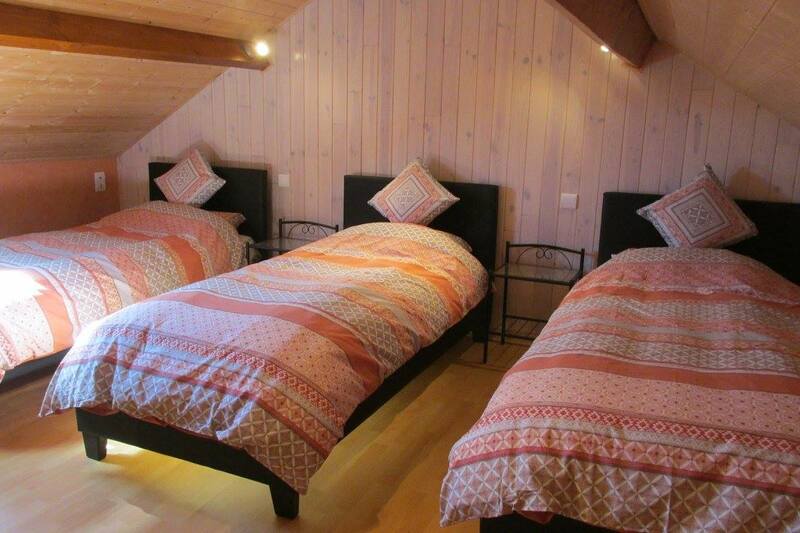 It is a good spacious attic-room with 3 single beds. 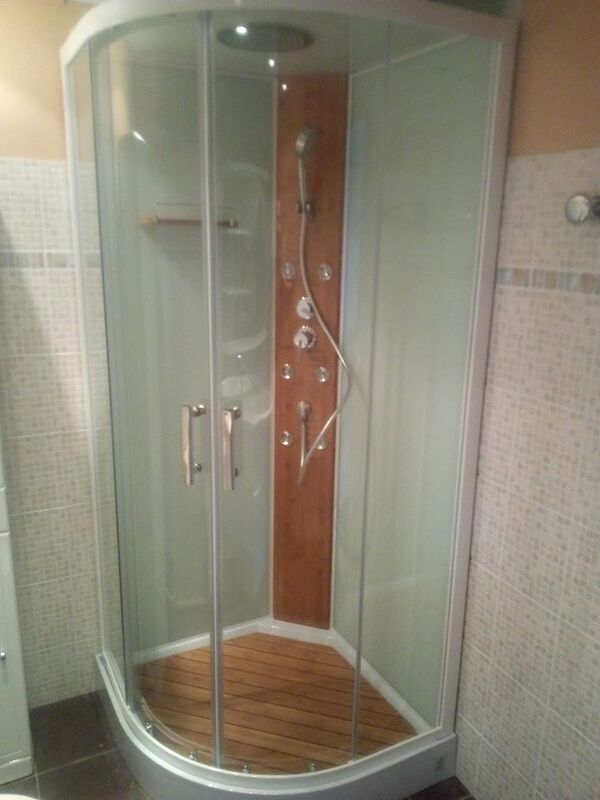 ... has a walk-in shower cubicle with body jets and above-head and hand-held shower heads. There is a toilet and wash-basin, with an illuminated mirror unit overhead. Bath towels, hand towels and flannels are provided. 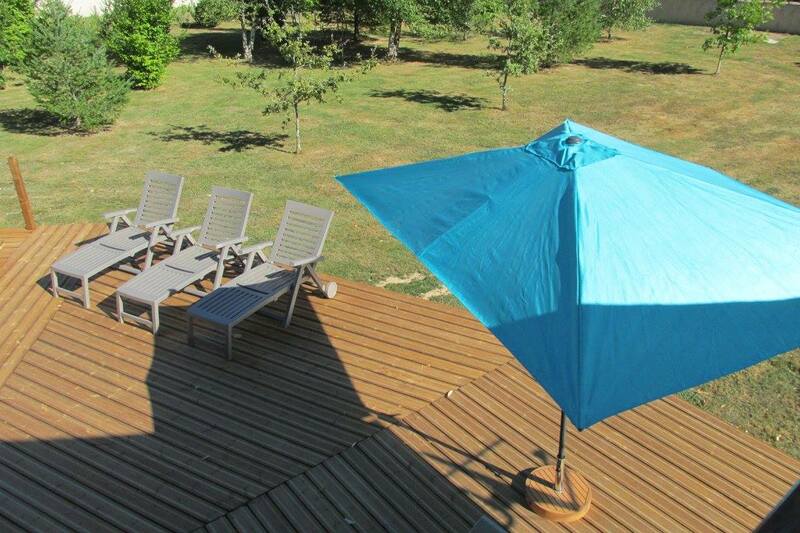 The Gîte and pool are set in a securely fenced garden (about half an acre), separate from the owners' house. 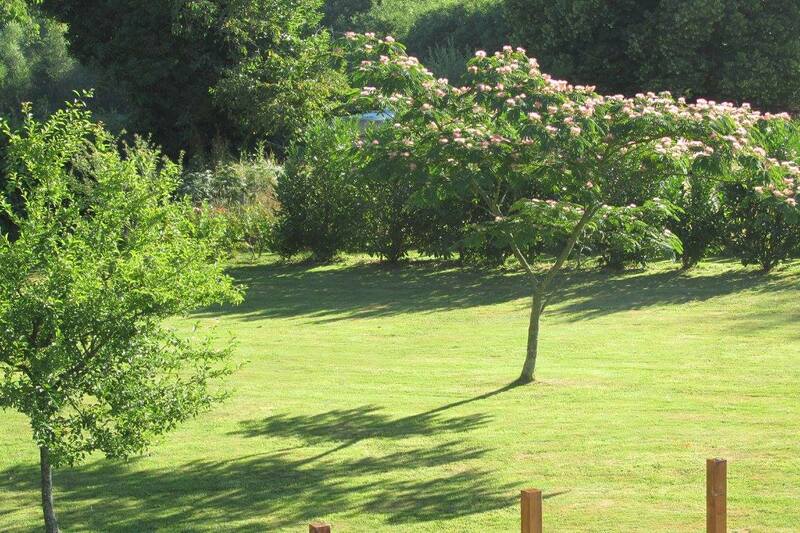 There is an adults' double swing in the shade of the trees and badminton & boules can be played on the lawn. 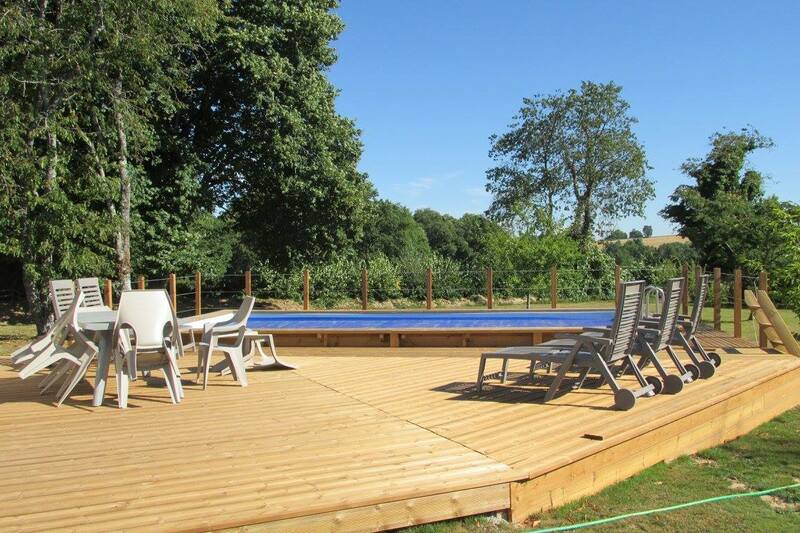 The above ground pool is 4 x 8 metres, with a level floor (no shallow or deep end) with a constant depth of 1.37 metres (open May -September). Don't worry - we do all the cleaning & maintenance. 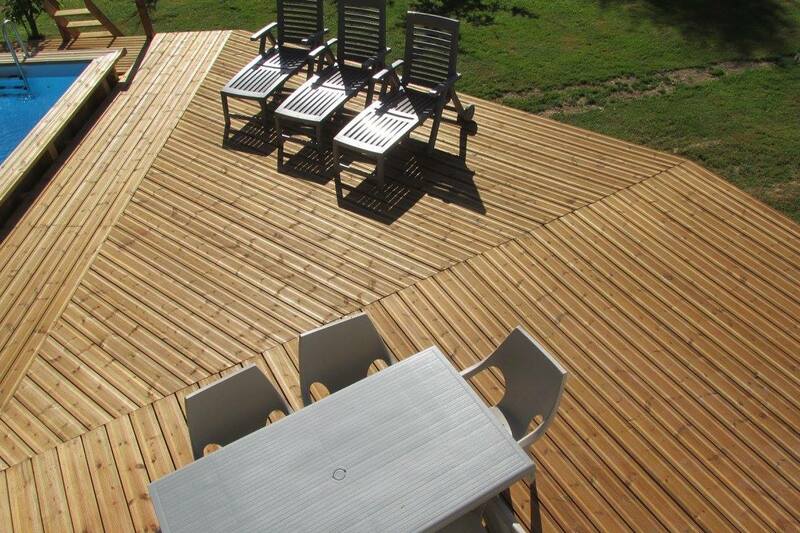 The deck around the pool is very spacious and offers 5 sunloungers and a table with 6 chairs. 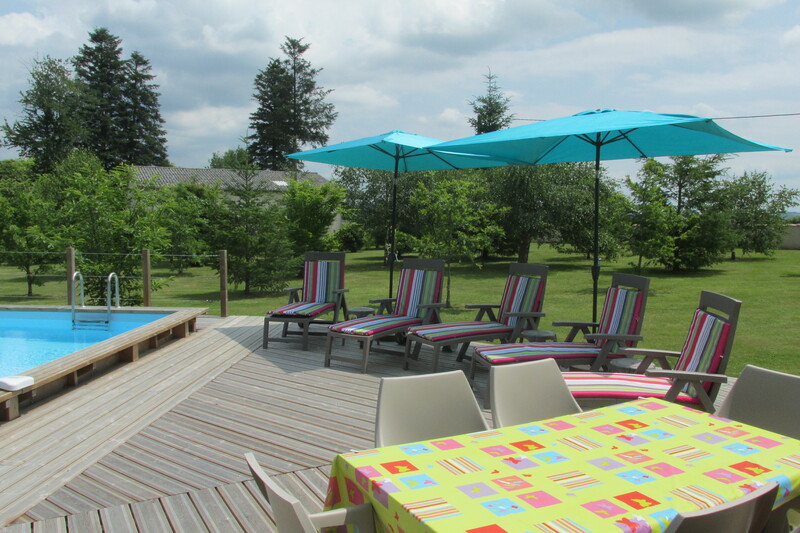 There is a BBQ for the guests' use and plastic glasses are provided for drinks by the pool. There is off-road parking for 2 cars. 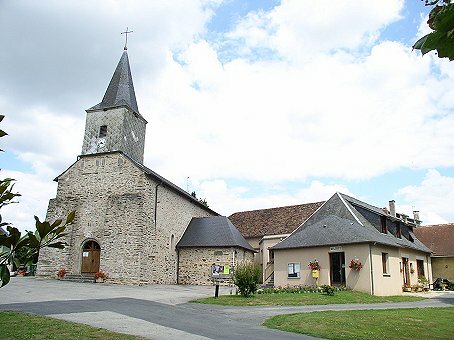 The nearest village is Montgibaud, about 1km away. It boasts a Michelin-star restaurant and a beautiful church. 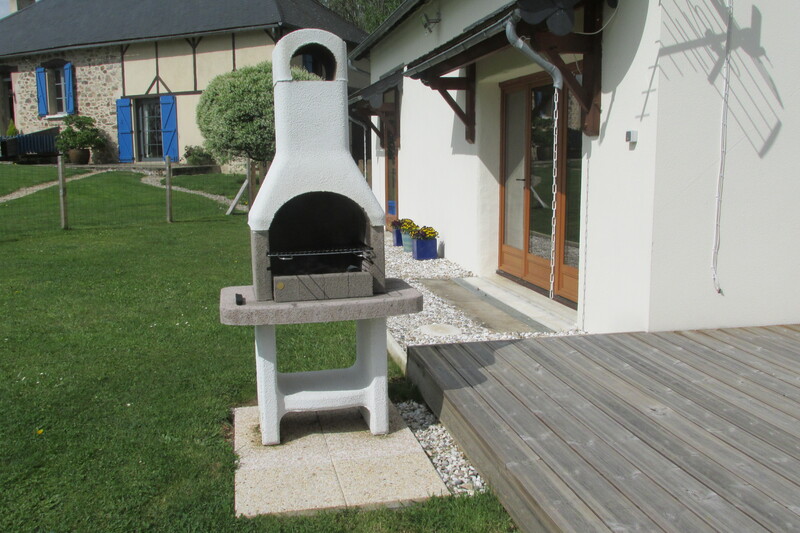 Meuzac is about 3km away and has a boulangerie, butcher and small supermarket. Lubersac is the nearest main town, about 8km away. It has a pretty town square with 3 cafes, a pharmacy, a patisserie - boulangerie, a bank, medical facilities, supermarkets, a petrol station and a post-office. 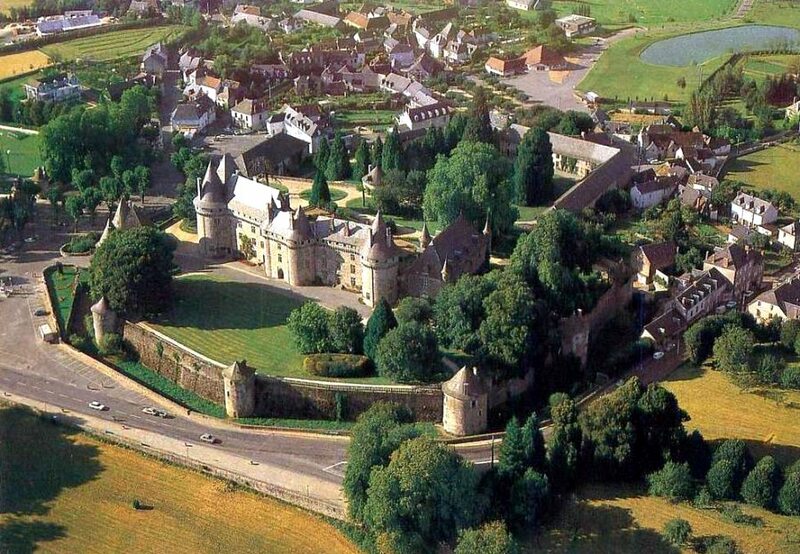 Famous for its large and beautiful chateau and National Stud (Haras national de Pompadour), both open to the public. Pompadour has a large and picturesque race-course which offers horse racing on Sundays in the Summer. Situated 3km away. 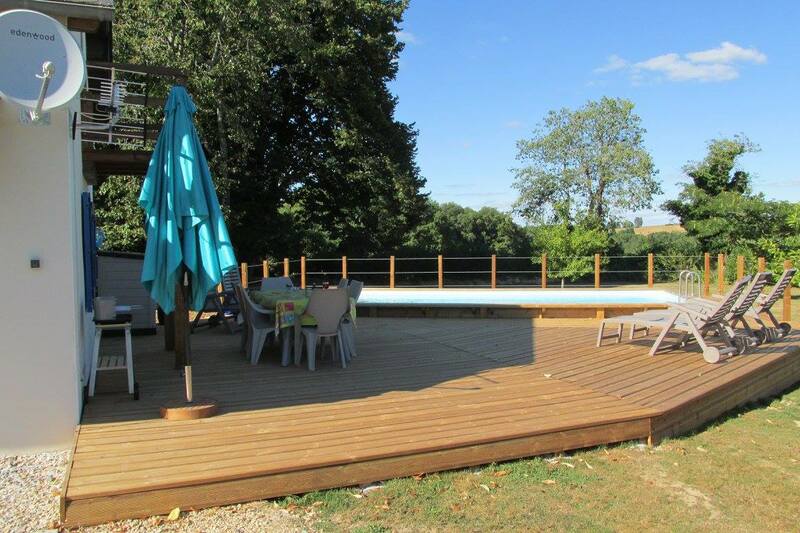 There are 2 lakes in Meuzac. 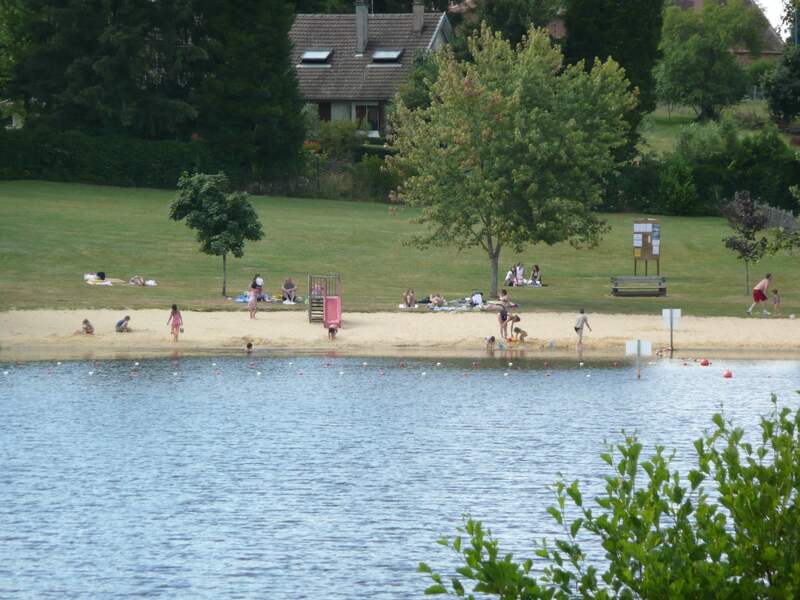 The smaller public lake has a beach for swimming and a bar, which are particularly busy in July and August. The larger lake offers water-skiing from April to September and there is an international water-skiing championship held here every July. A very good restaurant overlooks the lake. 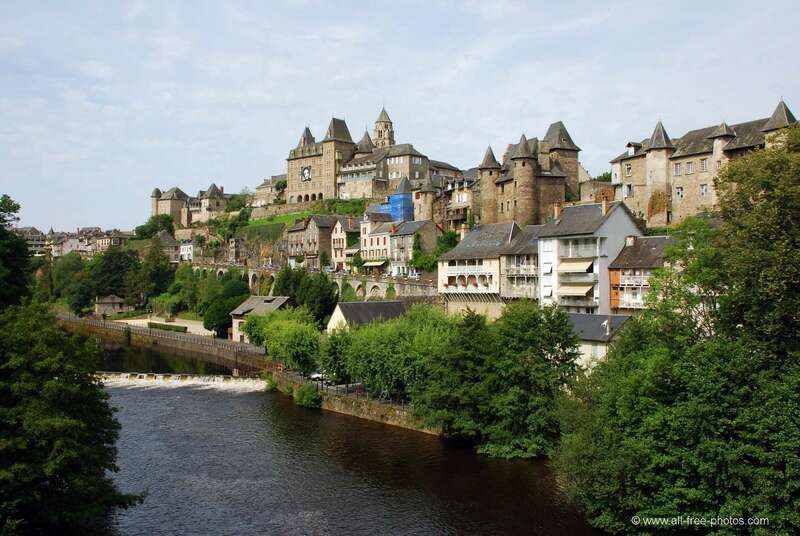 Built on top of a rocky outcrop, Uzerche is a medieval town that is known as the "Peach of Limousin'.. It has many interesting buildings and smaller houses, with features of architectural interest: ornate stone doorways, turrets and monuments. The Tourist Office is situated in the square of the old town 'vieille ville' and can supply a detailed map. Brive la Gaillarde - Saturday morning. 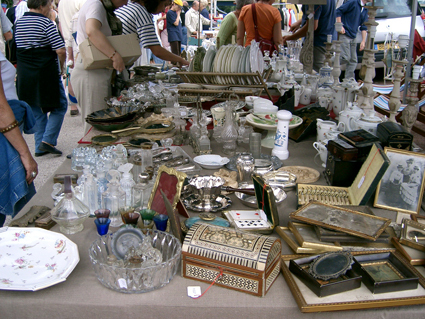 Car boot sales are very popular in France during the Summer and whole villages can be cut off, so that stalls can line the streets. 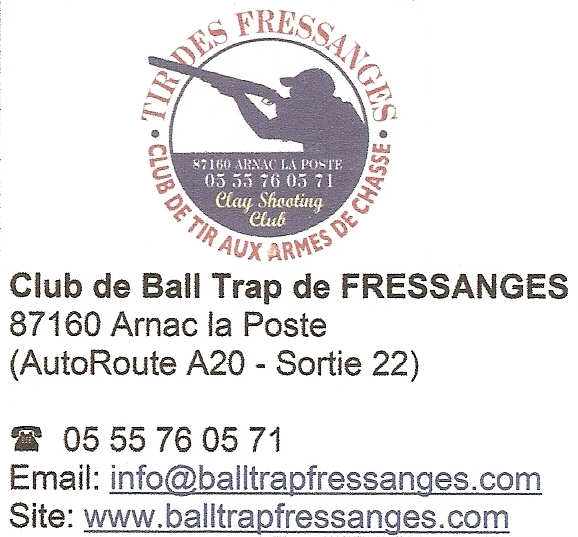 A clay-pigeon shooting club is situated north of Limoges. 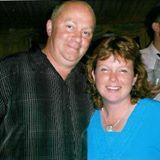 Richard is a member and can organise trips to the club which is owned by an English couple. 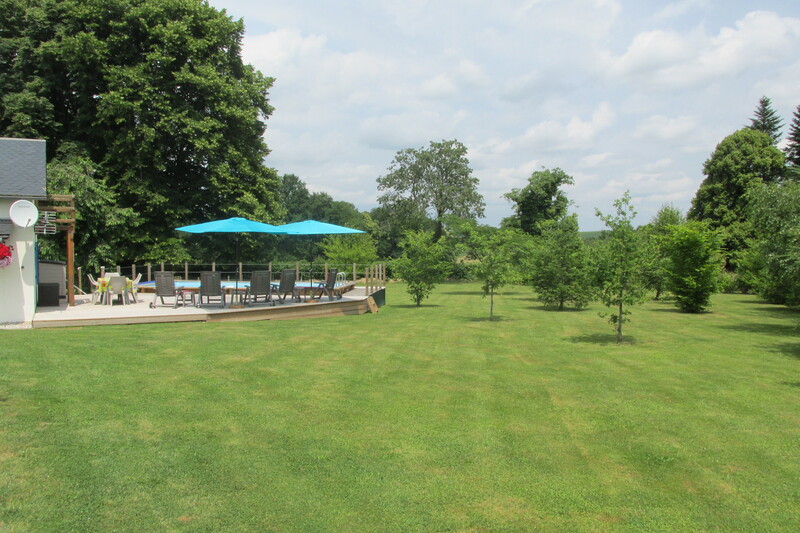 There is so much to do in this area for both adults and children alike. 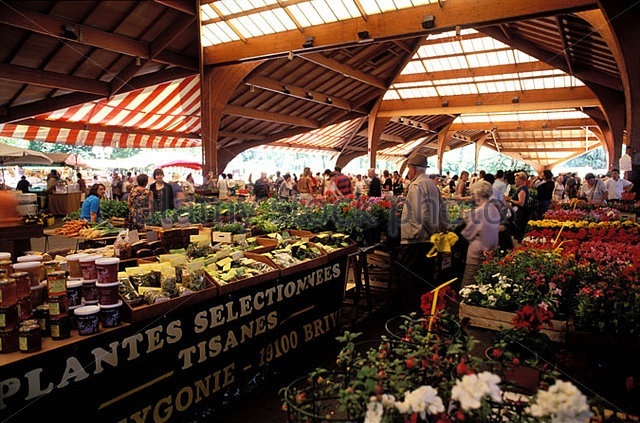 Limoges has a zoo and an aquarium, Brive has a waterpark and physical activities nearby include canoeing, biking and hiking. 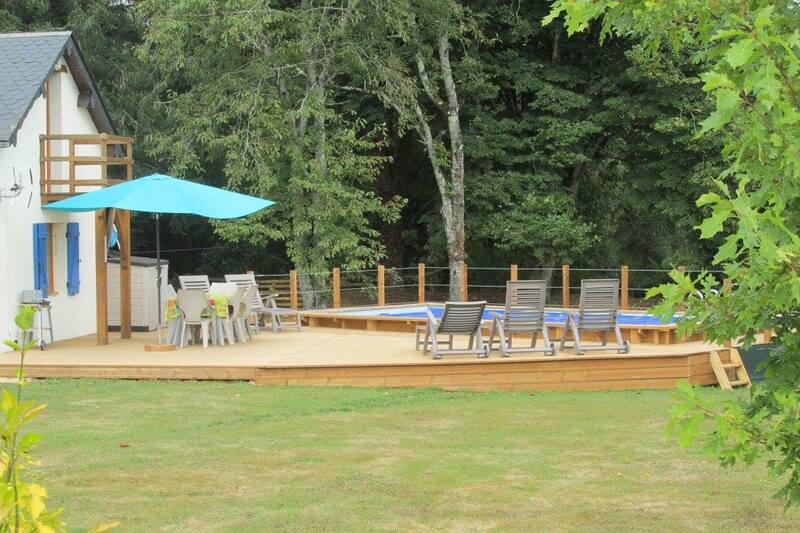 Or, you can just spend the day, lounging by the pool, enjoying the view. 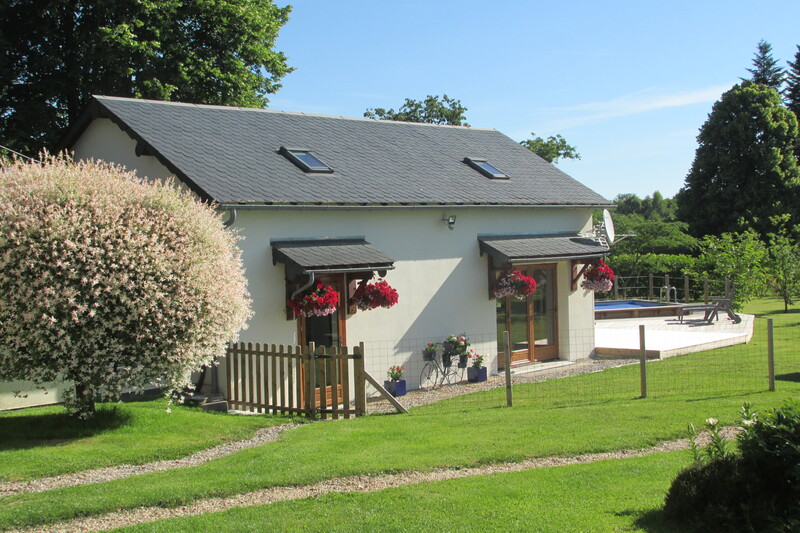 The Gîte sleeps 5 and is available all year. Prices include: linen, towels, heating, gas and electricity. Please bring your own towels for the pool. 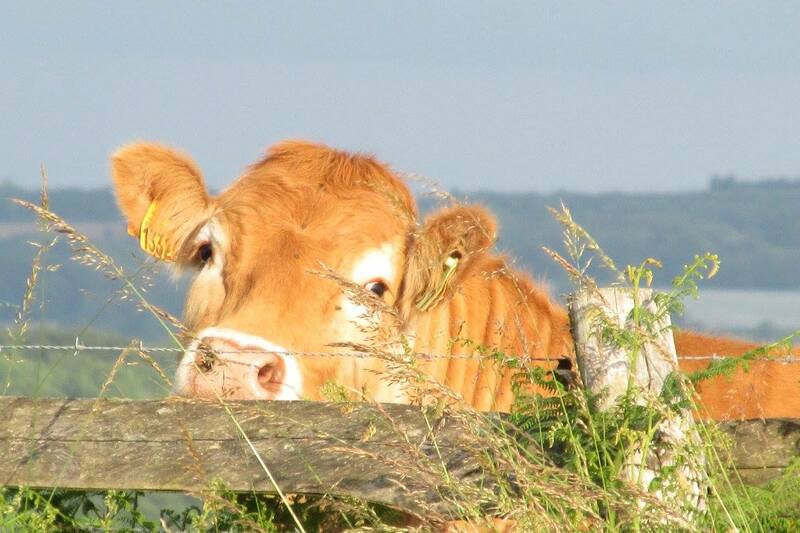 There is a supplement of €20 per week for pets. Winter Breaks October - April. 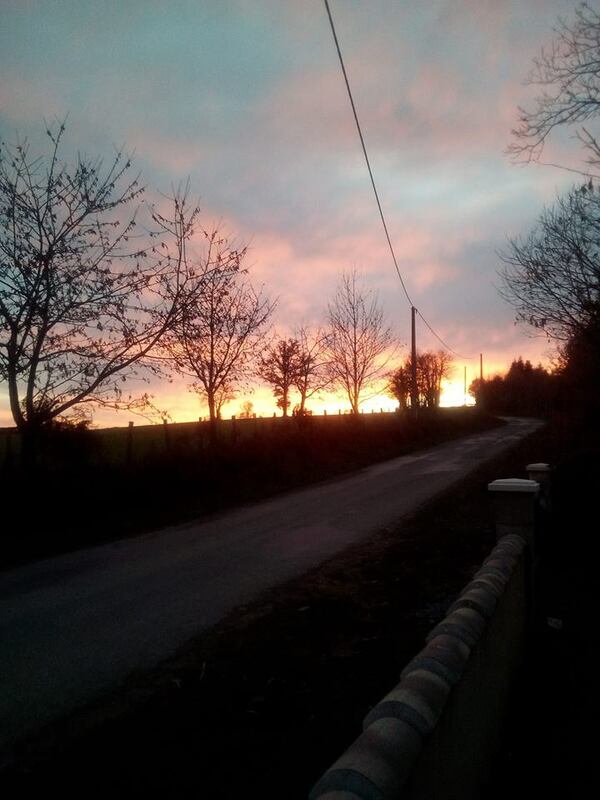 Take a winter break in this beautiful area of France. There are many interesting places to visit or just curl-up with a book or take a walk or just spend the day by the pool. Inclusive of: linen, towels, heating, gas and electricity. Contact us today and get a reply within 24 hours! Rentals run from 4:pm on the first Saturday to 11:am on the second Saturday. 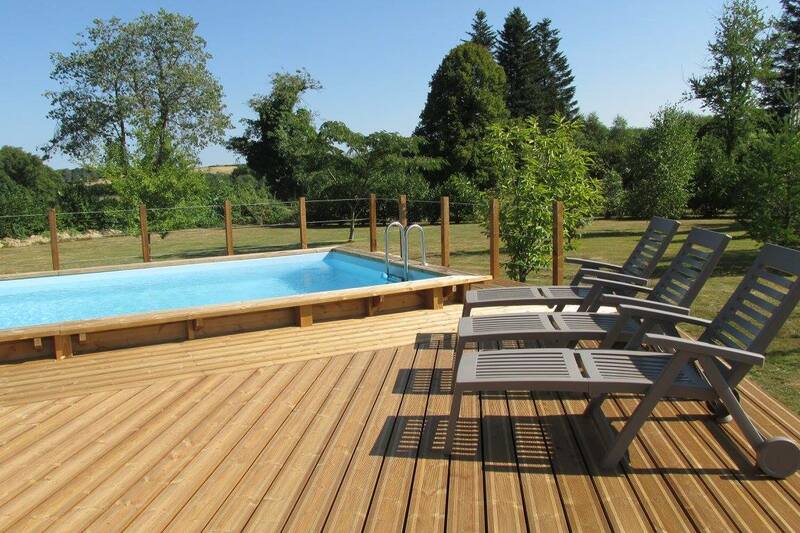 A non-refundable deposit of 25% of the total cost is payable at the time of booking. Telephone or email bookings will be held for 7 days to allow time for the receipt of the initial deposit. The balance must be paid no later than 12 weeks before the start of the rental period. Late payment may result in cancellation of the booking and the loss of the 25% deposit. Bookings made within 12 weeks of the rental period must be paid in full within 7 days of the booking being made. Payments are in euros please: cash, cheque or bank transfer. A security payment of €200 is payable on arrival to cover against damages. The deposit is returnable at the end of the rental period, less deductions for any damage caused by the renter or any member of their party. Guests agree to pay, in full, for any damage/loss in excess of the security deposit. 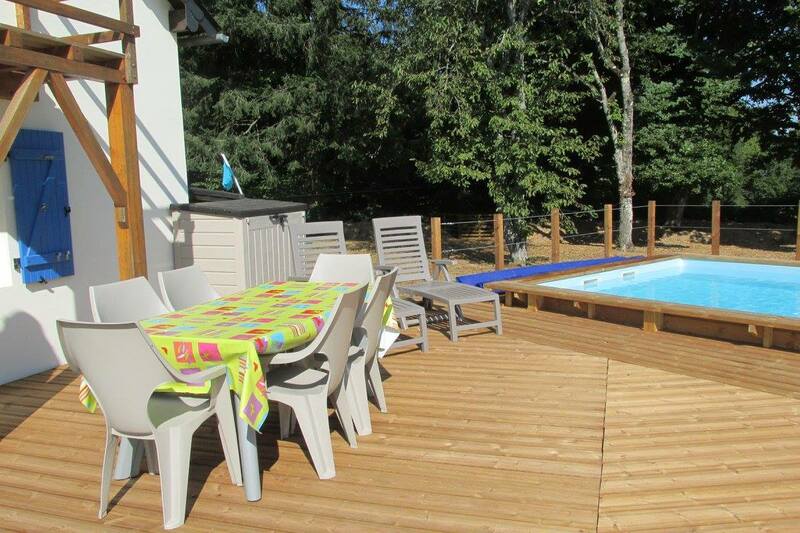 We have made every effort to ensure that the description of the gîte and facilities are correct. We cannot accept any liability for changes beyond our control. 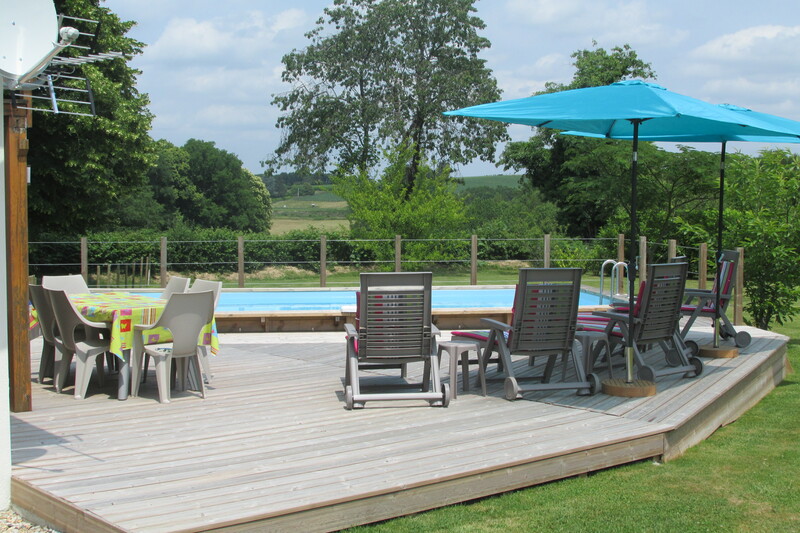 The number of guests staying at the property must not exceed the number specified at the time of booking. Rental charges are inclusive of water, gas and electricity. 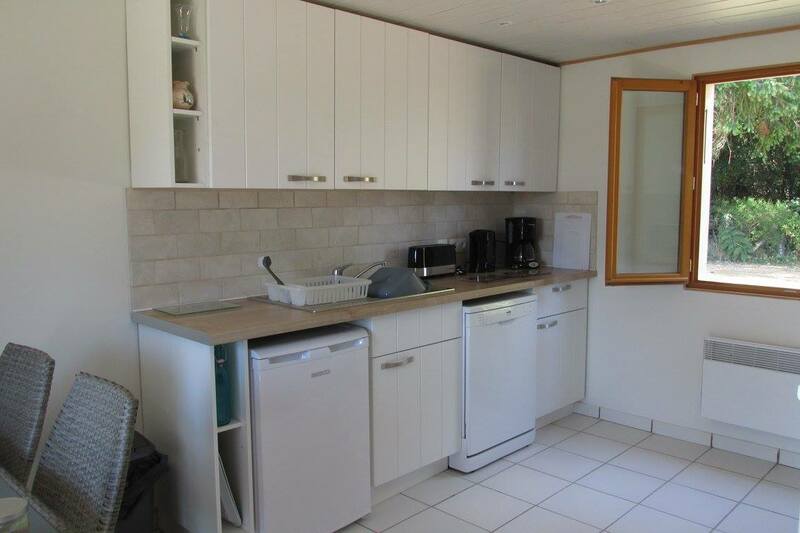 All bed-linen, hand, bath and face towels are included in the rental. The use of the property and its amenities is entirely at the guests' risk. 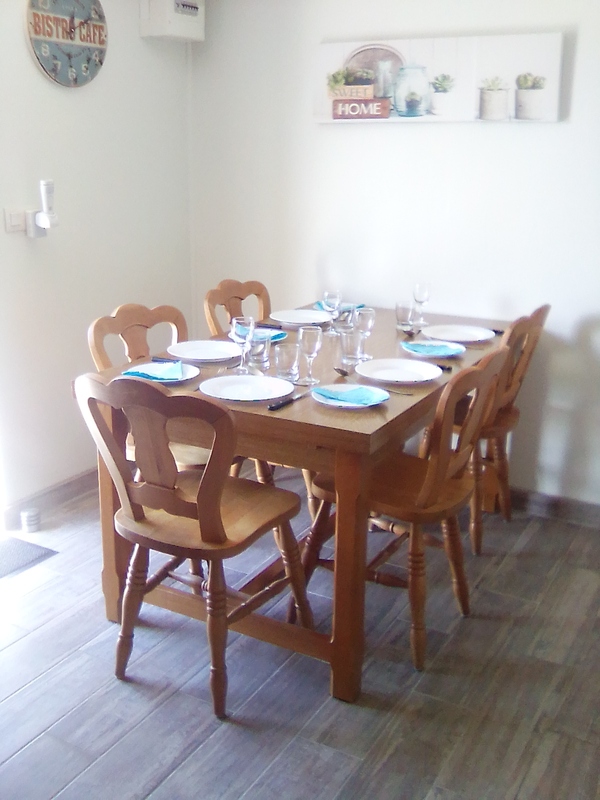 We have done everything possible to make the accommodation clean and tidy for your arrival. 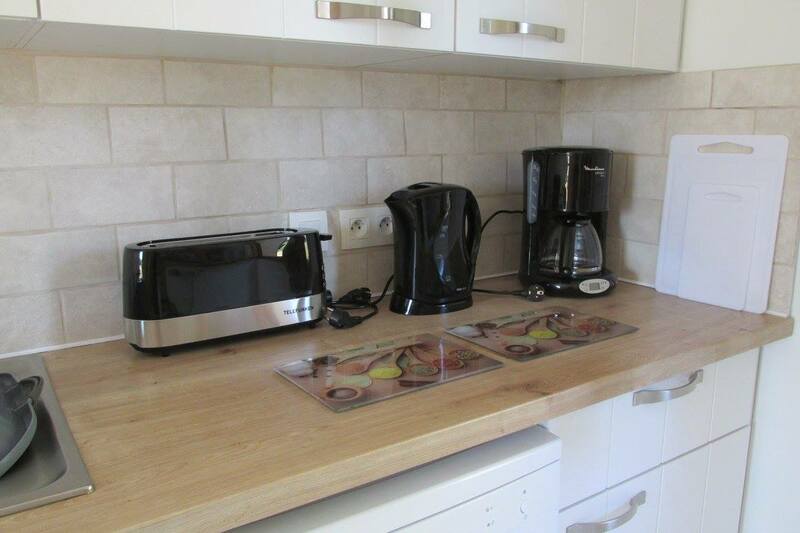 We, therefore, ask our guests to leave the property in the same condition. We reserve the right to charge the cost of any major cleaning required, which will be deducted from the security deposit. 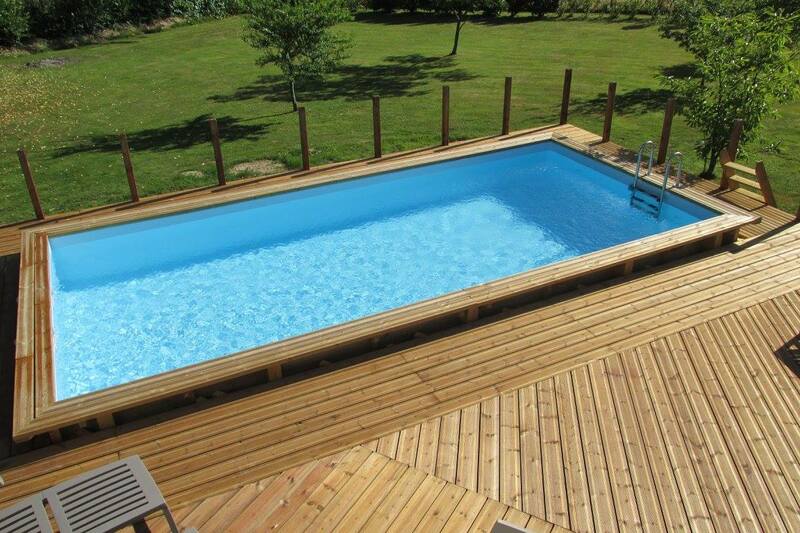 Our pool complies with French Safety Regulations. 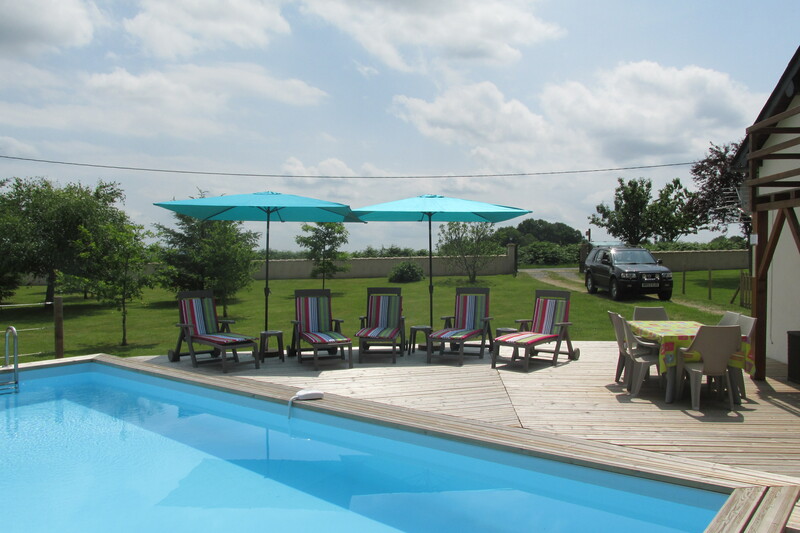 The use of the pool is entirely the responsibility of our guests. We can not be held responsible for accidents occuring in connection with the pool, except where directly caused by our own negligence. Guests must ensure that minors are supervised at all times in the vicinity of the pool. Pool towels are not provided. 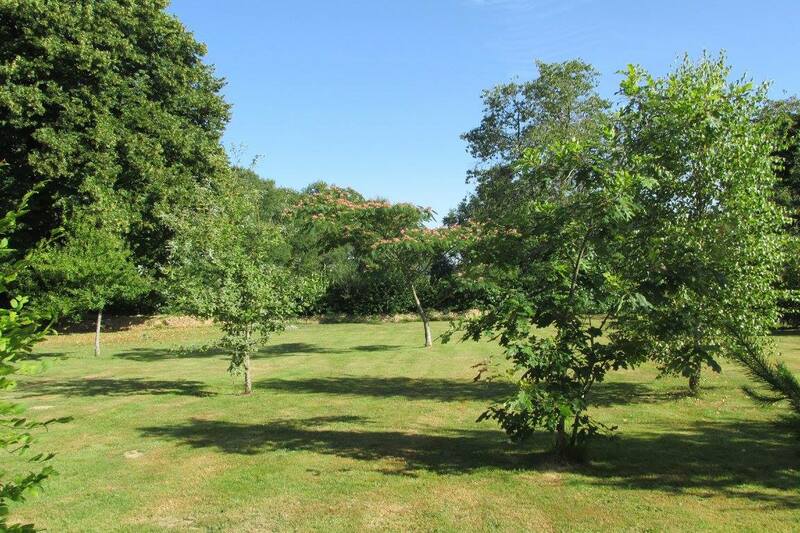 Bookings are made on the understanding that the property is available for the period specified. If, due to circumstances beyond our control, the property is not available, then there will be a refund of all monies paid and there will be no further claim against us. If the booking is cancelled due to force majeure or other circumstances beyond our control, we cannot accept liability. No refund will be given for any unused period of the rental agreement. 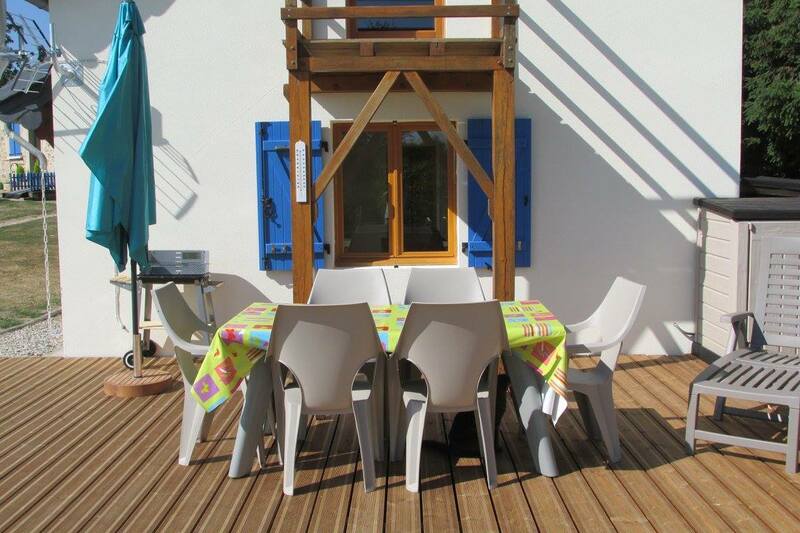 ... More than 12 weeks before rental: 25% of total holiday cost. 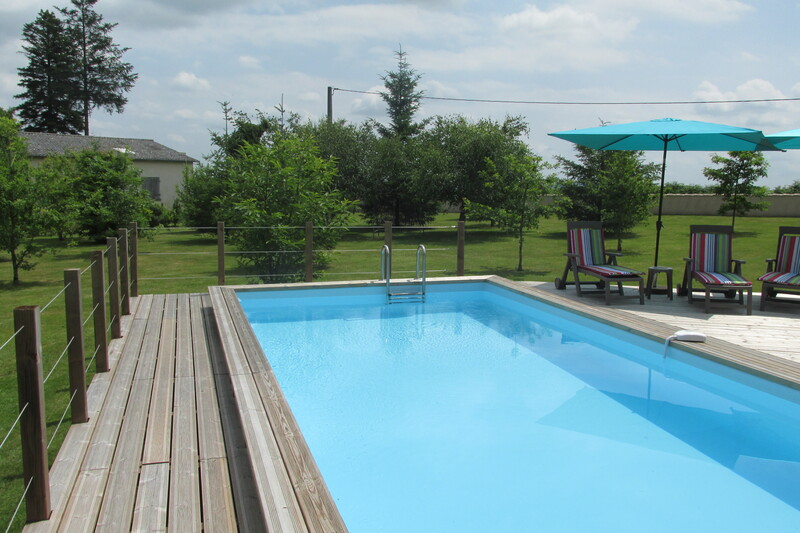 ... 8 - 12 weeks before rental: 50% of total holiday cost. ... If less than 8 weeks: 100% of total holiday cost. However, if we are able to re-rent the accommodation then a full refund of the monies paid will be made. Sorry for the smallprint! Please don't hesitate to contact us about our terms and conditions. We look forward to welcoming you to La Graffeuille and assure you that we will do everything we can to make your holiday enjoyable.